Researchers at the Center for Regenerative Medicine and Cell-Based Therapies at The Ohio State University have developed a portable, thumbnail-sized silicon chip that can, in a fraction of a second, reprogram skin cells so that they transform into just about any other cell type in the body. The noninvasive tissue nanotransfection (TNT) technology has already been used in mice and pigs to prompt skin cells to develop into complete blood vessels that join up with existing vasculature to heal necrotizing skin flaps and to rescue critically injured ischemic legs. In subsequent experiments, TNT directed the transformation of mouse epidermal skin cells into functioning neurons that within just a few weeks could be removed from the skin layer and transplanted into the animals’ brains to reverse the effects of a stroke. Dr. Sen also serves as the editor-in-chief of two journals, Antioxidants & Redox Signaling and Advances in Wound Care, both published by Mary Ann Liebert, Inc.
TNT is a nanoelectroporation technology that fires novel cell reprogramming factor genes directly into epidermal skin cells through temporary channels created in the cells’ outer membranes. The chip is loaded with the requisite reprogramming factors and placed on the skin. A small electrical charge is then passed momentarily through the chip, and this opens up tiny channels in the cell membranes, through which the genes are injected. “Because the electric current is very low due to the very high electric resistance of nanopores, this approach is benign with minimal invasiveness to the transfected cells or tissue,” GEN was told by Dr. Lee, who is professor of chemical and biomolecular engineering with Ohio State's College of Engineering in collaboration with Ohio State's Nanoscale Science and Engineering Center. In the Nature Nanotechnology paper, the researchers reported two sets of in vivo studies in mice, through which they reprogrammed skin cells to transform into vascular cells, first to prevent necrosis in full-thickness skin flaps, and then in a second set of animals to rescue complete limbs from which the femoral artery had been removed. The legs of untreated control animals quickly became necrotic due to lack of blood flow. In contrast, animals treated using TNT in the lower limb skin grew functional blood vessels within a couple of weeks. By the third week, the affected limbs were well served with new vasculature and healed, without any other form of treatment. 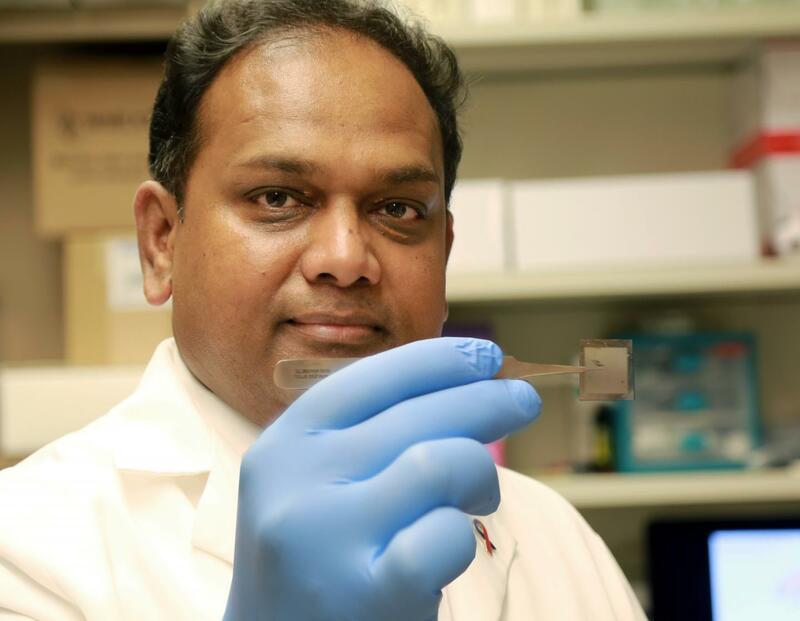 Chandan Sen, Ph.D., holds the chip that could revolutionize medical care. 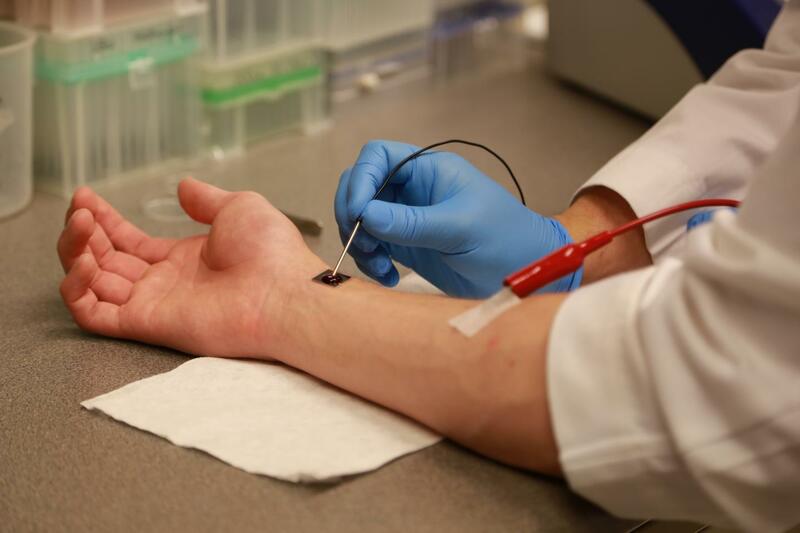 The chip was able to heal serious wounds on mice with a single touch by converting skin cells into vascular cells. The range of potential applications is huge, he maintains. As well as demonstrating that TNT can generate blood vessels and functional neurons from skin cells, the researchers have also transformed mouse skin cells into insulin-producing cells that can sense glucose in the animals’ blood and secrete insulin in response. The TNT technology relies on two unique components, Dr. Sen continued. “First, the design of cargo that may be plasmid, DNA, or even RNA to induce plasticity. The ability to use RNA for such purposes minimizes the risk for genomic integration. Second, a 3D high-throughput nanoelectroporation (NEP) chip generated using cleanroom-based micro-/nanofabrication techniques.” The nanoelectroporation technology was originally developed six years ago by Dr. Lee’s team. In vivo application of the platform was realized when Dr. Lee’s lab responded to interest from Dr. Sen to progress to tissue reprogramming in vivo. Dr. Sen projects that, with expedited FDA approval, initial TNT clinical trials could start within a year for serious limb ischemia applications. 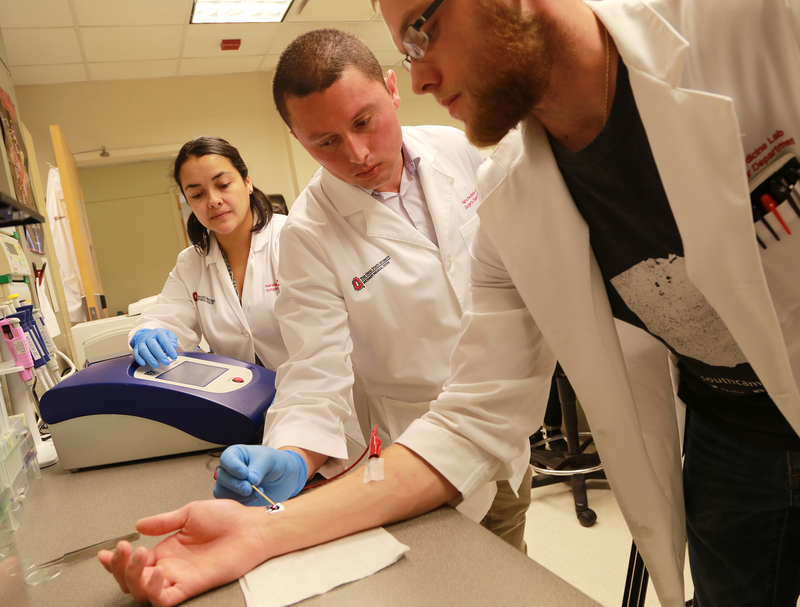 A smal NIH grant is separately now funding early work in the field of neuropathy, and the team is also collaborating with the Walter Reed Army Medical Center for potential field-based applications of TNT in rescuing injured extremities and peripheral nerve injury. “We have a novel 3D TNT chip design optimized for clinical applications,” Dr. Sen noted. “Further work will probably involve collaboration with industrial partners.” Work is ongoing to develop cost-effective fabrication techniques using optimum biocompatible materials. “Miniature TNT chips are also required for delicate tissue (e.g., eye, ear) transfection,” Dr. Lee pointed out.